SEPTEMBER 8, 2016 HOW DOES YOUR KNITTING GROW? Our Guild President and Vice President introduce the theme “Grow” for this year’s Knitting Guild Season with a program to help you grow your skills through photography and technology. We’ll learn tonight how to photograph our knits beautifully and stylishly, just like the top designers do! And we’ll go on an interactive journey into new technology that the Guild will be incorporating this season. 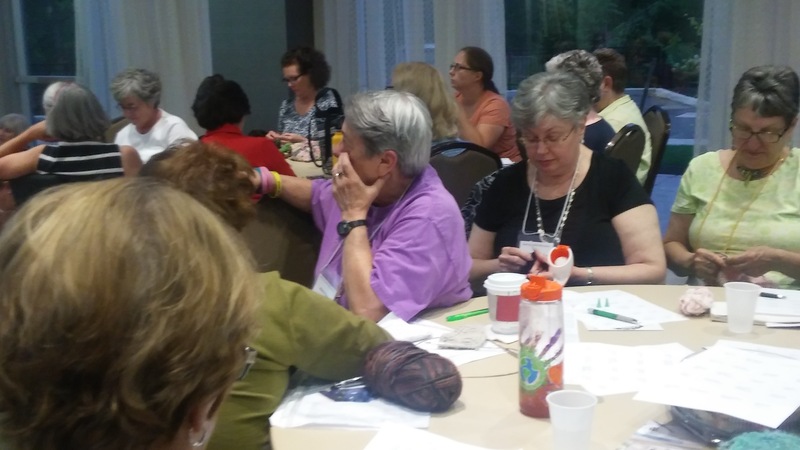 After the President’s kind introductions, get-to-know-your-neighbor activity, and general announcements there was a well-prepared description of this year’s Knit Along (KAL). Then it was my turn to take center stage. 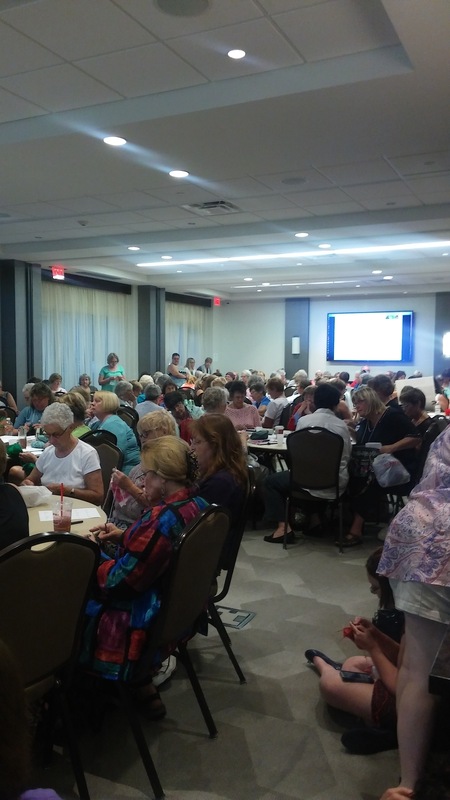 Talking to a full house, my first objective was to explain some of the particulars of the social network site most members of the guild use and to demonstrate some simple navigation of our own website, The Knitting Guild of Greater Buffalo. With computer in tow and a beautiful two- screen room, I was able to point out these things. We also visited email with an explanation of its purpose, at least for this year. And then of course, you cannot talk knitting and technology without heading to Ravelry. Those of us on Ravelry, an online source for knitters and crocheters, utilize its many capabilities differently. 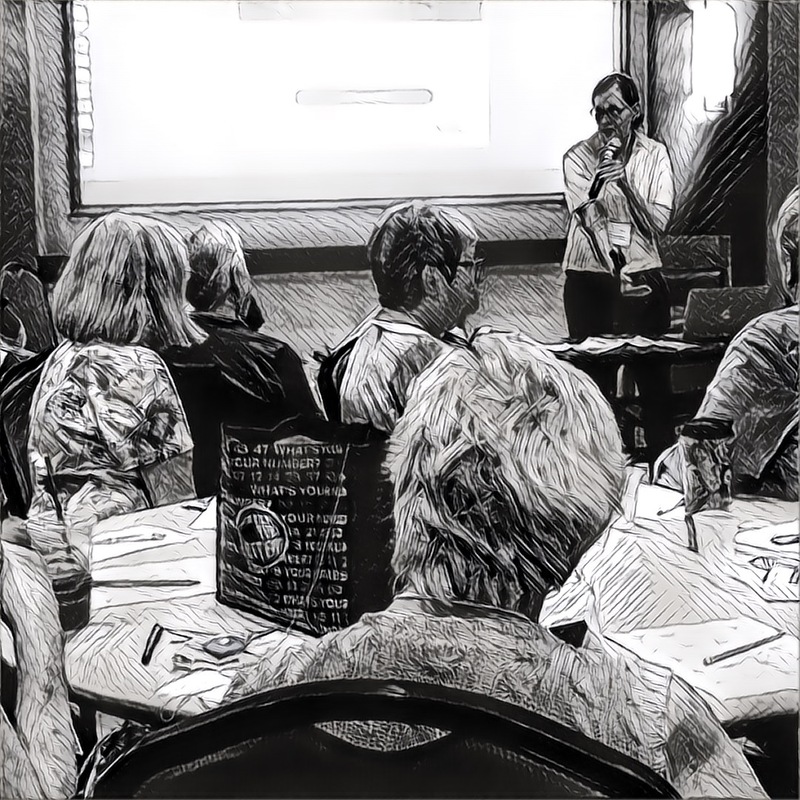 In fact, a knitting organization could spend many a programs sharing and explaining the intricacies of Ravelry: the how/why of the queue function, finding patterns function, and/or the stash function of buying and selling, to name a few. What I was speaking on was just one aspect of the whole of Ravelry and what I, personally have gleaned from this site; how viewing other peoples’ projects has led me to new skills of modeling and photographing. What has become a large part of my behavior when on this knitting site, in particular, is the ability to peruse other people who have knitted the same garment as me. While I love to peruse other peoples’ knitting in general, I find viewing with a focus much more purposeful as well as a better use of my time. Utilizing Ravelry as a resource, to answer specific questions I have asked myself has actually been a tremendous inspiration for me. Also, in the modeling of them. I ask myself as I am surfing, “How are others presenting their hard work? What lighting do they use? How are they standing? Who is taking their picture? What camera do they use? Other techniques?” Much like viewing a knitting magazine or published book, people’s artistic flair, points of view, creative energies flow from these photos and I like to stop to take notice. Studying, in my definition, also includes complimenting and asking questions to the artist/knitter/designer through the messaging system of Ravelry and it is especially exciting when I get a helpful response. It was and continues to be important to me to study photography because it is the link between the hand knitting of care and diligence and the sharing of it, publicly. I have gotten quite confident with my knitting and skill-level but felt a certain disconnect on how to BEST bring my work forward on these social sites. In the program, I then ventured to my website, hollyknits where I shared how I have taken this inspiration from studying others and created my own ‘fashionscape‘, that is an effort of my hubby and I, combining local sites as on-sight photo locations paired with hand knit style/design. I feel this effort and willingness to open myself to the public via online methods has not only presented ideas for presentation of my projects but has also provided some surprises by taking me to places I only dreamed of before. Dreams like how this effort has led to being interviewed by Vogue Knitting, a magazine I have personally subscribed to for over thirty years. It has led to added personal confidence, enough so as to head to New York City to walk the Readers’ Runway for Vogue Knitting Live. Even dreams of presenting publicly in front of large groups such as The Knitting Guild of Greater Buffalo. Allowing technology to enter into my world of knitting has given me opportunity beyond my wildest dreams. This was not a talk on Ravelry. We surfed a variety of sites. I cannot say this was how to photograph or model. Not enough time. This was not a brag session. And, I do realize one of the reasons for overflow of attendance was the curiosity of our new space. 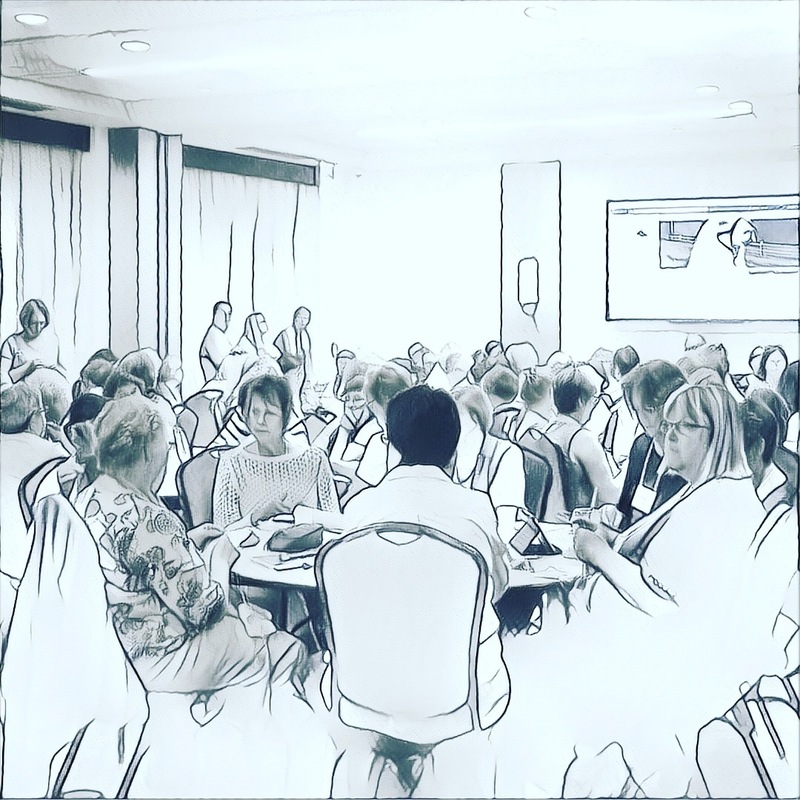 This was, however a talk on personal efforts utilizing technology, in general and how this knitter has let cyberspace enter her world allowing it to serve as a venue for research, inspiration, and self-discovery. This night may have also been a little revealing on the changing face of our knitting guild. The social group of ‘tea and cookies, come knit with me’ seems to have entered into a world of programming for purposes of learning from each other, growing as individuals and/or as a community, and opening up minds and hearts to thinking about knitting in ways we may never have thought before. Some of you may be interested in viewing how the photo shoot went for the two-tone cable taught to us last year (2015/2016 season) by Heather Lodinsky. NOTE: The photos that have a unique editing touch to them are edited in a photo editor app called Prisma. Can you tell how much I love it? Great experience – I’m sure your teaching expertise was a great help. I will definitely take a look at Prisma, it looks awesome. I am probably using all my prior experiences in my retirement effort with the knitting guild. I love Prisma! Hope you are settling in. It sounds like a great talk – I bet folks learned a whole lot! just one knitter trying her best. People were attentive and gracious. So interesting to hear different people talk on a common topic. I am learning that is a boat load of reasons why people knit! I suppose there is – but I hope they all enjoy what they are doing.